With school starting for many students this month, We thought this would be a great time to give you 6 reasons why Zap Calendar may just be the best Joomla calendar application for school web sites. Zap Calendar is a powerful calendar system for Joomla, but you may not know that Zap Calendar can promote your events outside of your web site. Here are 6 things you didn't know Zap Calendar could do. Happy 10th Birthday, Zap Calendar! Development of Zap Calendar began 10 years ago in 2006 for use as a calendar for a private school web site running Joomla. In those 10 years, Zap Calendar has been continuously improved upon by the original developer, adding new features and add-ons to make Zap Calendar the best Joomla calendar available (BTW, Zap Calendar still is a great calendar for a school web site with support for both calendar year and school year display). Today there are over 30 Zap Calendar add-ons available. To help celebrate, all Zap Calendar subscriptions and renewals (basic, standard and pro) are 30% off the regular price for a very limited time. We do not have a sale very often, and this is the biggest discount we have ever offered. This discount also applies to our basic subscription, so a new Zap Calendar subscription can be purchased starting at under $21 USA. If you are using Zap Calendar Lite, now is a great time to upgrade to a paid subscription to receive additional add-ons at the biggest discount we have ever offered. Your subscription entitles you access to the latest version of Zap Calendar and add-ons as well as the use of our online forum. And unlike many other Joomla extensions, Zap Calendar's subscription is for 12 months, giving you a full year of updates and support. So if you are interested in purchasing or renewing your subscription to Zap Calendar, now is the best time to get it. But hurry, this offer is very limited. Use the coupon code "HAPPYTENTH" when ordering to receive your discount. 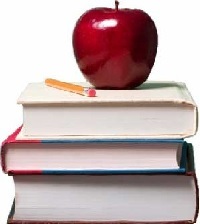 Click here for Zap Calendar subscription information and ordering information. A complete list of enhancements and fixes can be found in the Zap Calendar change log. 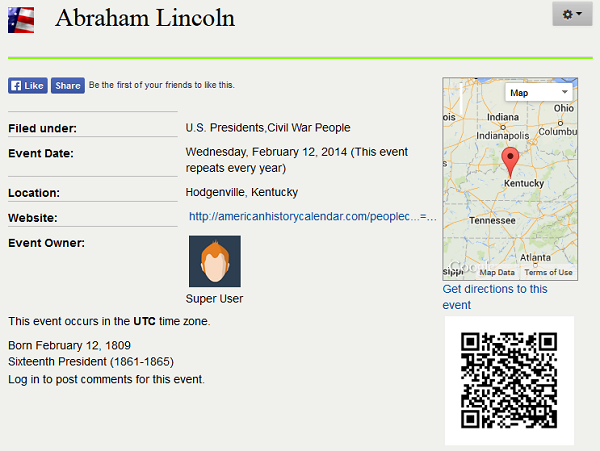 You can click here to see a sample screen snapshot of the event details page with the new plugin positions. We have just released our first video, "Zap Calendar 101: The Google Maps Plugin". This video demonstrates the Google Maps plugin for Zap Calendar, one of our most popular plugins for Zap Calendar. You can follow along with the demo using the Zap Calendar demo website, so you can try out the features hands-on without needing to setup your own website. Click the video icon to watch. Join our Facebook page and you will get notified when new videos become available. What other videos would you like to see? Front end enhancements include improvements to the popup event window (and switching from MooTools to jQuery libraries) and links to events shown in the upcoming events listing. Back end enhancements include RSS feeds and private iCalendar URL feeds (to use when you want to allow export of your calendar to select people only). For a complete list of enhancements and fixes, you can read the Zap Calendar 4.0 change log. Zap Weather has also been updated to fix a "duplicate key" error when installing the previous version. A plugin was also recently released for Zap Calendar 4.0 that will show weather forecast information from Zap Weather in your calendar. Google recently dropped support for their Google weather API. This means the Google Weather plugin for Zap Calendar will no longer function and the Zap Weather plugin is now the only weather plugin supported for Zap Calendar. You can find out more information on these products by visiting ZapCalendar.com and ZapWeather.com . While visiting, please "like us" on Facebook to receive the latest news on these products. Zap Weather version 9 has just been released. This release supports Joomla 2.5 and now Joomla 3.x . Also added in this release are 700 additional weather stations to choose from and a fix displaying weather alerts from a module. Zap Weather is a free Joomla component for displaying weather for any U.S.A. location or territory. Since its first release 8 years ago, Zap Weather has always been free and with "no commercial interruptions". That is, there are no fees, commercial advertising or links to external sites. Zap Weather uses data from the National Weather Service, a U.S.A. government organization and its services are paid for by the tax dollars of citizens. If you are not already using Zap Weather on your site, try it out today and let those tax dollars work for you! The migration of add-ons to Zap Calendar 4 continues with 4 additional add-ons included with version 4.0.1. This release adds integration add-ons for JomSocial and Community Builder (pro version), and a mini month add-on (all versions), which is now a separate module. This release also contains one of the most popular add-ons for Zap Calendar, Google Maps, which provides mapping and geocoding of events created in Zap Calendar (standard and pro versions). This release also includes several fixes. With this release, there are now over a dozen add-ons available with Zap Calendar 4. 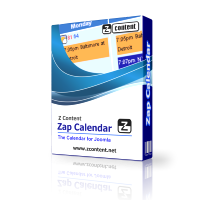 Zap Calendar 4 is the latest release of Zap Calendar that supports Joomla 3.x websites. Over 10 add-ons are included with this initial release with more add-ons coming soon. One add-on you will want to enable is the new title plugin, which displays your calendar browser buttons at the top of the calendar in the front-end. This is now an add-on so that it can be swapped out with a custom plugin for those who like to customize Zap Calendar. A couple of names have changed with this release to better describe their purpose. Calendar "Views" are now called "Calendars", and the iCal Subscribe plugin is now called "iCal Sync". If you are migrating your event data from Zap Calendar 3, you can create an iCalendar export file from Zap Calendar 3 and import it into Zap Calendar using the iCal import under the tools menu. This method will import your events as well as categories and locations that are associated with those events (make sure you select the "import ievents nto separate categoires" option). A table upgrade is not supported due to the changes made to support multiple time zones and other features. Zap Calendar 4 beta is now available to all current subscribers on the Z Content web site. Z Content just released its 30th add-on for Zap Calendar: The QR code plugin. This plugin allows users to scan calendar events using a QR code scanner app on their phone to easily add the event to their calendar. 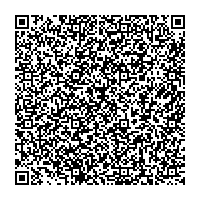 The QR code can contain the event title, date and time, location and the description of the event. QR codes can be printed or scanned directly from the web page. This plugin is included starting in the 3.1.1 release of Zap Calendar Standard and Pro editions. You will need to be running version 3.1.1 or later of Zap Calendar to use this plugin. This is the third Zap Calendar add-on released since version 3.1 and brings the total add-ons available for Zap Calendar to 30. The other recently released plugins are an e-mail reminder plugin (all versions), which automatically sends e-mail reminders to event owners prior to their event, and gravatar (Pro version only), which utilizes a user's avatar uploaded to gravatar.com (used with event owner field and with the comment and RSVP plugins). The Zap Weather plugin was also recently updated to support Zap Weather version 8 and Joomla 2.5.